There are a lot of good reasons to use reel mowers but there's always one time I really wish I had a reel mower. When overseeding. You likely have some areas in your lawn that need to be overseeded, sometimes every year. The grass could get thin or bare for various reasons such as being in a very shady area. Normal gas, and even electric, rotary mowers have a fast spinning blade that creates a lot of turbulence under the deck. This can dislodge the seeds and give you poor seed to soil contact. Once the grass starts to grow, the impact of the blades can rip the new grass out of the lawn since the roots aren't long and strong enough at that point. When you plant new grass seed or over seed it is recommended that you don't mow your lawn until the new grass reaches 2". That's fine and dandy but the existing grass is going to grow and need to be cut in the mean time. Kentucky bluegrass can take up to 3 weeks to germinate. Sometimes more. That's just to germinate, it will take some time to get established so that it's strong enough to survive mowing. Some people will mow their existing lawn very short to stunt it's growth but that's still a long time and will injure the existing grass to have such a dramatic cut. If you're overseeding to improve your lawn, it doesn't make much sense to harm the existing lawn. Even if you slowly mow it down very short, by only cutting 1/3 of the blade at a time, you're new seed is still going to have to compete with the existing turf which will likely need mowing to keep it from getting too long. Using a reel mower seems like it will do the trick. They don't produce as much suction or turbulence as standard mowers and if the blades are sharp it will give a nice clean cut without pulling up the plant. 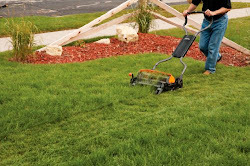 Reel mowers are considered to give the best cut to your lawn. You won't get the tearing you get from a rotary mower. Most people don't keep their mower blades sharp enough, some never ever sharpen them. I don't blame them, messing around with the underside of your gas mower can be unnerving, even if you followed all the necessary precautions such as removing the spark plug, pulling the starter cord to make sure it doesn't start and to get rid of any gas that might be in the combustion chamber and using something to lock the blade in place, etc. That feeling comes back whenever I see This Old House landscape contractor Richard Cook on TV. (Don't know if that's how he lost part of his finger or not.) You should be careful with a reel mower too. Forget about "going green", forget about saving money on gas, forget about the noise... Reel are better for your grass and allow you to mow if you've overseeded. That's why the mowers used for putting greens have reels. Update: Since I wrote this years ago, a new push reel mower has come out from Fiskars. In my head I was designing a new style of reel mower and it looks almost exactly like the Fiskars Fiskars 18-Inch Staysharp Max Push Reel Lawn Mower . Especially the wheel design. Looks very popular too. Wish I would have done more with my idea. For cool season grasses, it's good to leave the blades long, especially during the summer. There are only two mowers that can go up to a cutting height of 3". The most popular seems to be the Scotts Classic Push Reel Mower. It's also very affordable, less than $100 currently including shipping. There are many great reviews for it and it comes from a large, reputable company. There is also the Gilmour 20" Reel Mower it is slightly more expensive than the Scotts Classic but it also comes with a grass catcher and claims to have self-sharpening blades. This supposedly makes the Gilmour Reel Mower a little louder but it's still quieter than a gas powered mower. The grass catcher is nice to have but it's better to let the clippings go back into the lawn to deliver nutrients such as nitrogen. I own some Gilmour products such as the lawn sprinklers and timer that connect with normal garden hose and their Flexogen hose which has been the best hose I've ever used. When I had question regarding the sprinklers, they were very helpful so I wouldn't mind buying more products from them. I'm leaning more towards the Gilmour vs Scotts Classic, but I probably won't get it for a while. One of the reasons is that the Gilmour uses ball bearings where the Scotts uses nylon bushings that seem to wear away fairly quickly. The impression seems to be that the Gilmour is sturdier. The only thing I'm concerned about is the noise but many have stated that keeping it properly adjusted and lubricated reduces the noise. Gilmour recommends you don't hose it off to clean it, just wipe it down after use. Since hosing it off is easier, I think most people are doing that, which could wash off the lubrication on the self-sharpening bits, causing more noise. If you want something quiet, the Sunlawn Manual Push Reel Mower seems to fit the bill and is made in the USA. It's a little more expensive and the maximum height is 2.5" but that should be fine. It is non contact like the Brill Reel Mowers so that the blades don't come in contact with the bed knife which reduces noise and wear on the blades. Unfortunately the Brill mowers are more expensive and the maximum cut height is about 1.75". There were some negative reviews for the Sunlawn mower concerning poor customer service. I haven't tried to contact them but I did check to see what the Better Business Bureaus report on Sunlawn had to say. Looks like when they get complaints Sunlawn takes care of them. Most of the reviews though were good. I still haven't decided on which one but it's a toss up between the Gilmour and the Sunlawn mower. The way I see it Gilmour vs Sunlawn boils down to higher height, cheaper, includes bagger (which I don't care much for), company I've been happy with for the Gilmour and made in the USA, quieter, not self sharpening but the no contact design doesn't wear out blades. Both seem to be more sturdy than the Scotts. One thing I keep seeing in reviews is people complaining about reel mowers stalling when a twig gets in them so you have to move away any twigs before hand. This is something you should do even with gas powered mowers. Twigs and other debris will dull or damage your blade quickly. Rotary mowers are already pretty tough on lawns and dull blades can damage and brown your lawn.